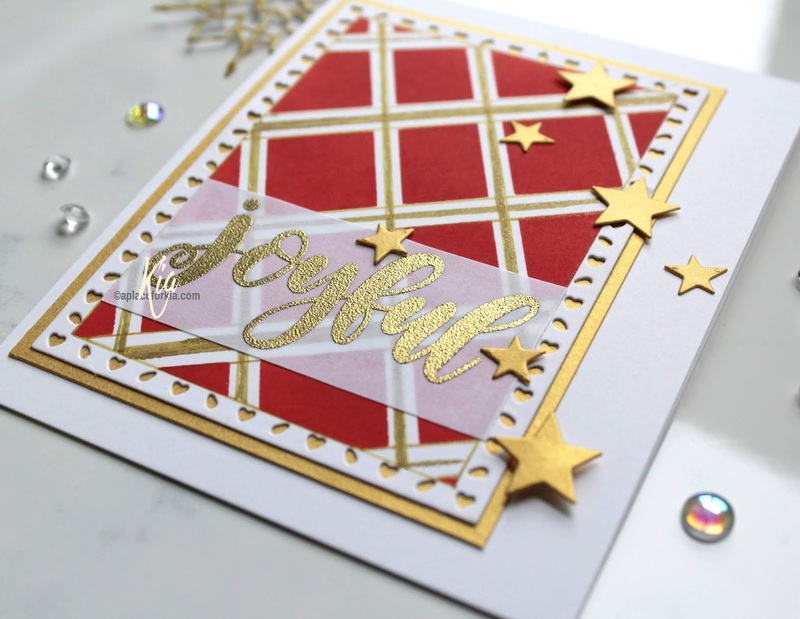 A plaid background along with gold starts and a gold embossed sentiment are some of the elements on this card today. I first die the plaid panel using my Sweetheart Layers die, then taped off the areas to make the plaid using masking paper that I cut into strips of different sizes. I also taped around the Sweetheart die as I only wanted the plaid inside the frame. 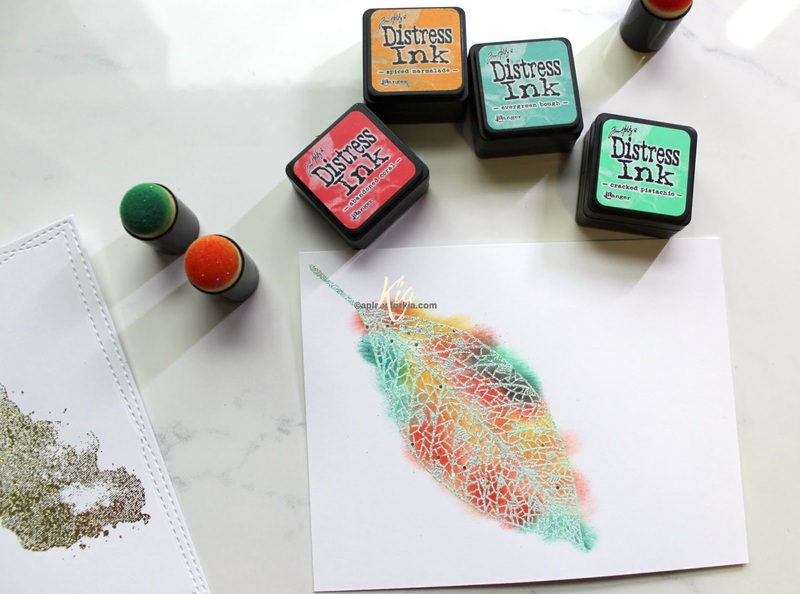 I then sponged on the Tim Holtz Candied Apple Distress Oxide ink, doing a heavy layer to get that deep colour. Once that was complete and using Wink of Stella Gold brush I added the fill in the white area. With a gold pen, I went around all the plaid along with all the squares. 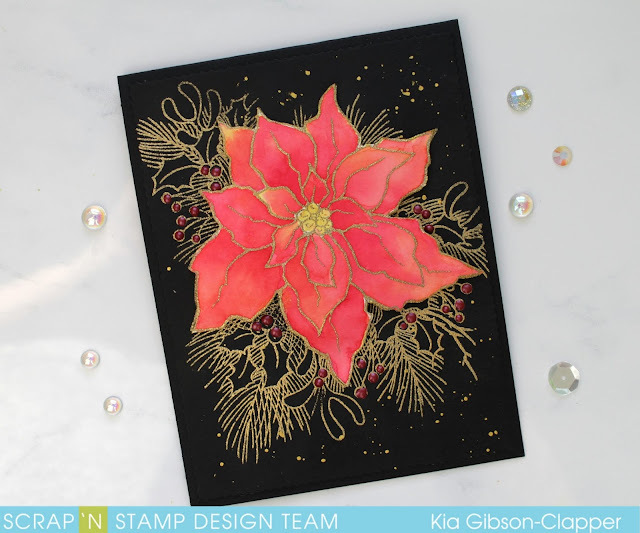 I stamped the sentiment on vellum paper using gold embossing powder and attached to the panel with vellum tape. I die cut the stars from gold metallic paper and attached, a few with foam squares and also matted the plaid panel with the gold metallic cardstock. I have a friend in mind for this card, which is why I picked the Sweetheart frame, she is a sweetheart. It doesn't matter that it is Christmas, it all works. Thank you for visiting today. 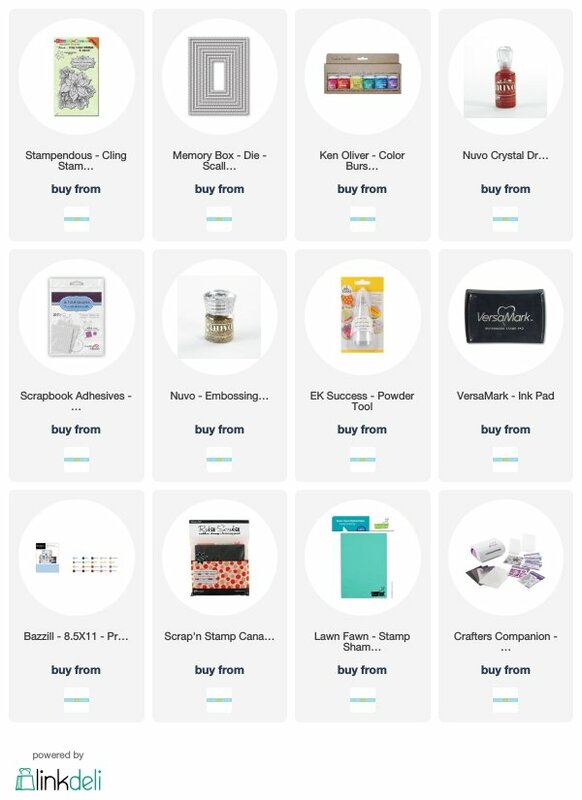 I have included links to the products I have used below for both USA and Canada, at no cost to you. 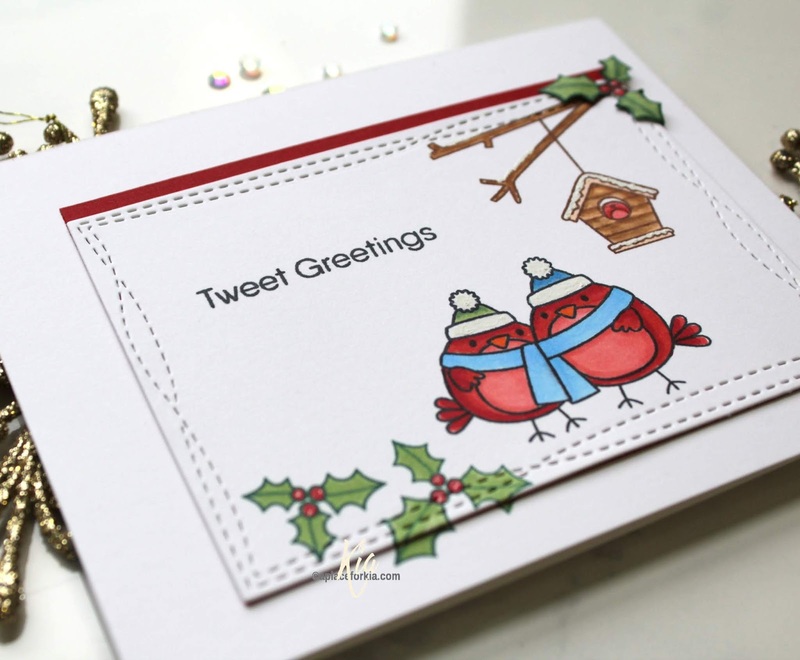 I have 2 posts today, a quick sample card for the Clean and Simple Challenge at Splitcoaststampers today, and following this card a Christmas card. 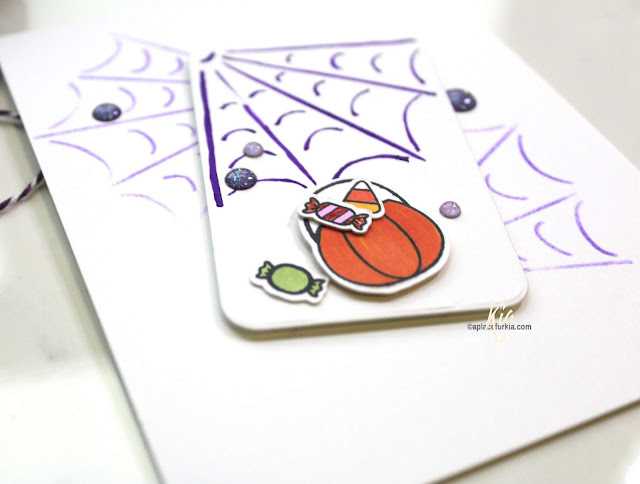 I first did the panel with the spider web and treats. 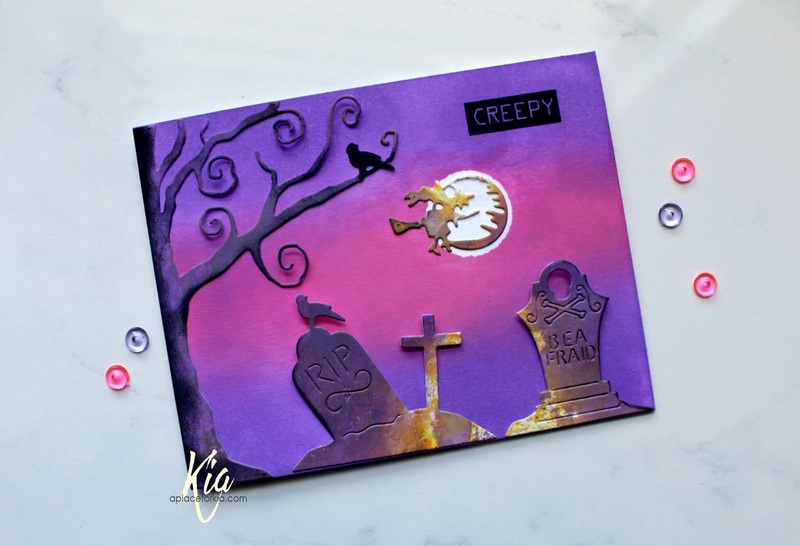 I used Nuvo Aqua Flow brush in purple, then stamped and cut the treats and pumpkins and coloured with Copics. The panel is a tag that I cut the tag part off. I glued on the candies and attached the pumpkin with foam squares. 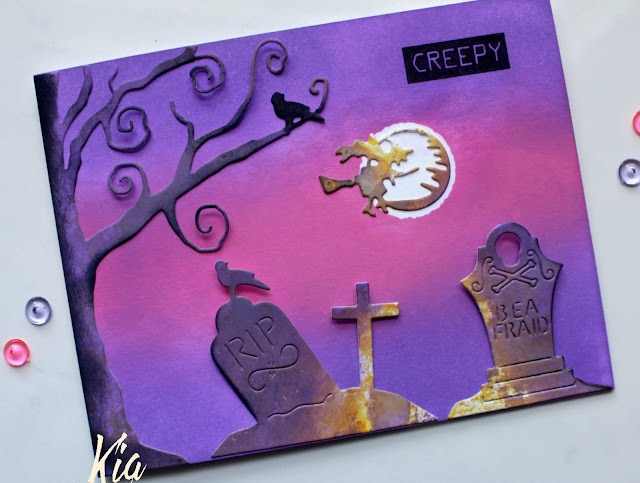 Once the panel was done, I did the stenciling on the card base using Tim Holtz Distress Inks in Wilted Violet then attached the panel using foam tape. I finished with some gumdrops in purple tones. Thank you for dropping by today. I have provided Canadian and USA links at no cost to you below. Back today with a Christmas card. It is that time of year that I need to get started as I do make a lot. 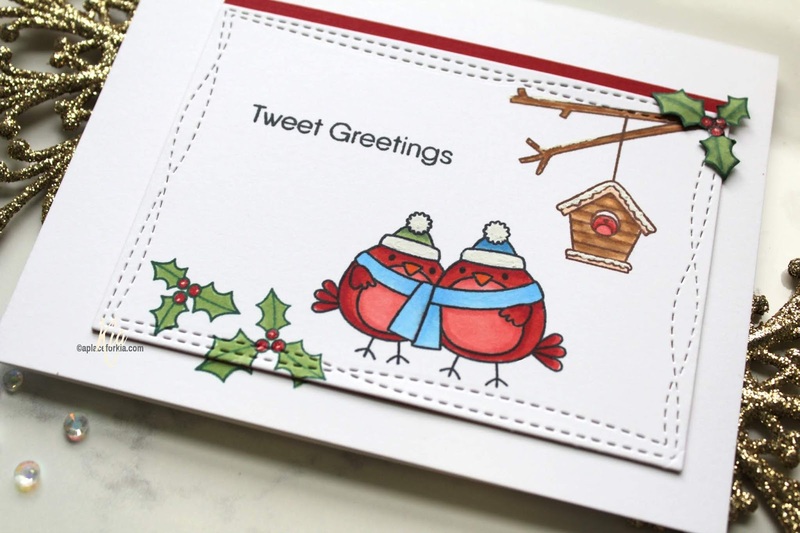 I am using My Favorite Things Tweet Greetings Stamp Set today. I could not resist these little darlings, well actually I can not resist any bird stamps! This card started first with the die cut panel. As I am using Copic markers I am also using the panel. 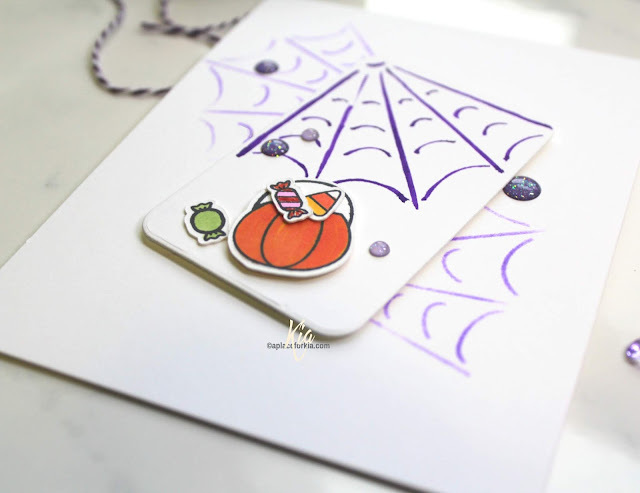 I don't like the bleed showing on the inside of the card from the markers and I also don't like putting another piece of cardstock on the inside. So, a panel solves it for me. I used the ever cute Wonky Stitched dies for today. In my Misti I layed out my scene and stamped using Memento Tuxedo Black for the birds, Ranger Sepia for the branches and birdhouse, and Library Green for the holly. I hung a bit of the holly over the panel, so stamped and coloured that bit on the card base as well. I then matted the panel with red cardstock and attached it to my base, lining up with the holly. I stamped another holly, coloured and fussy cut attaching it to the top right corner of the panel. To finish I added white gel pen as snow to the birdhouse, branches and as fur to the hats, and as highlight to the berries. I then went over the berries with Wink of Stella. Thank you for visiting today. 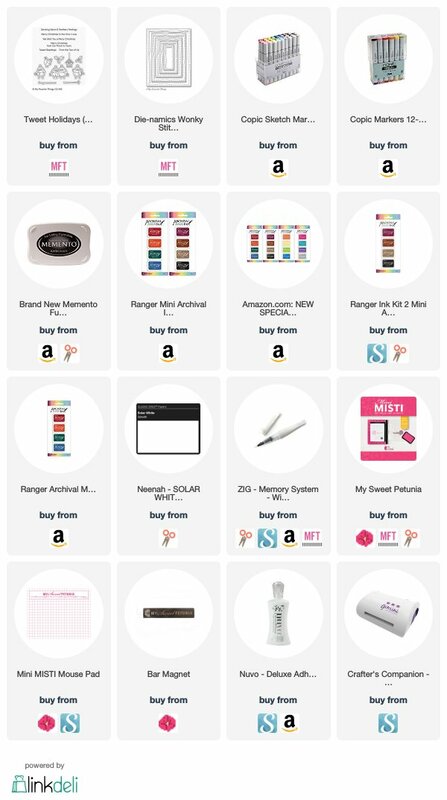 Below are Affiliate links to the products I have used at no cost to you, connecting you to Canadian or USA sites. Time for a little "creepy". I have to say this is a favourite of mine. The dies are great and not too big and the label stamp is perfect for this kind of card. And the colours, yes the colours are perfect ~ lol. 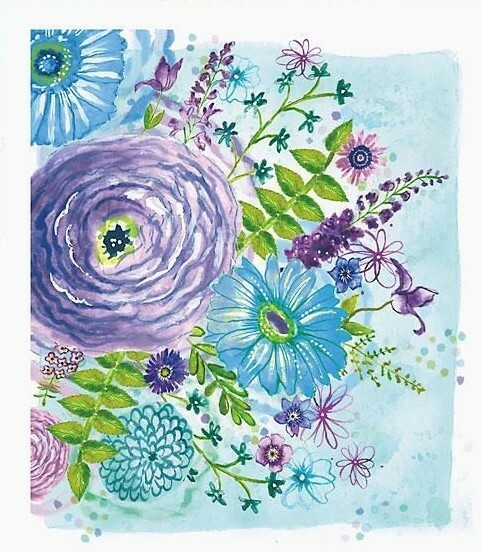 I started by sponging on my colours using distress oxide inks for my background. For the headstones and the witch, using watercolour paper, I mixed up distress oxide inks and spritzed with water, then dragged the die cuts through until I liked the look. I also die cut the tree and dragged it through some wilted violet, then added black soot. I styled the top of the headstones a bit and attached the bottom portion only, leaving the top unattached, like they are in a graveyard. And to finish, I stamped the retro label stamp using Ranger Archival Jet Black ink. 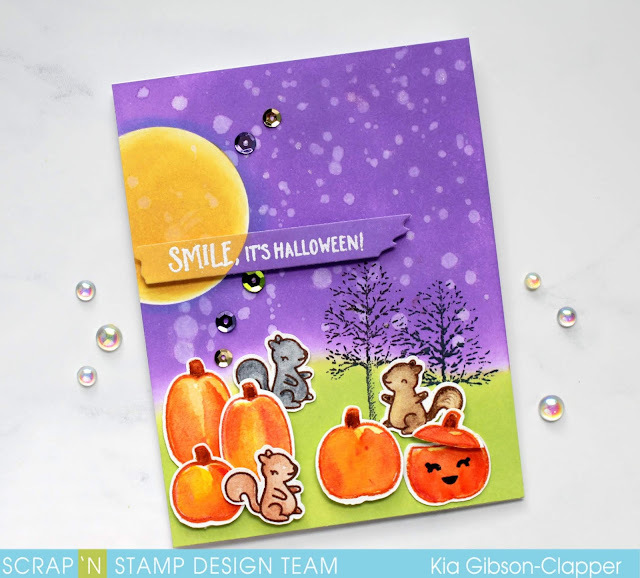 I am sharing a card I did for Scrap'n Stamp Canada. I was given this stamp set last year as a gift and have not used it before now, so I thought I would give it a go for my post. 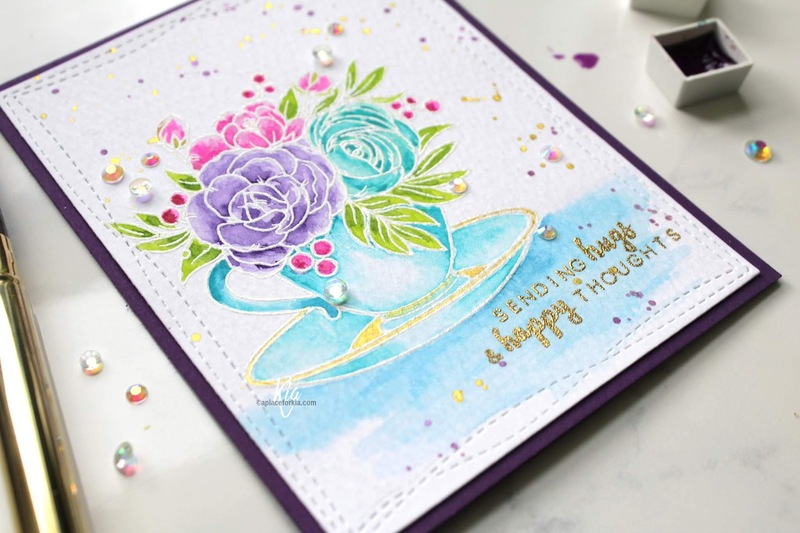 I wanted to do something a bit different with this image so I started by using black card stock for my base and for the die cut panel, which is cut with the Memory Box die and the border frame removed. On the panel I prepared the piece for embossing using my powder tool. Being as it is black card stock I was liberal with the powder. 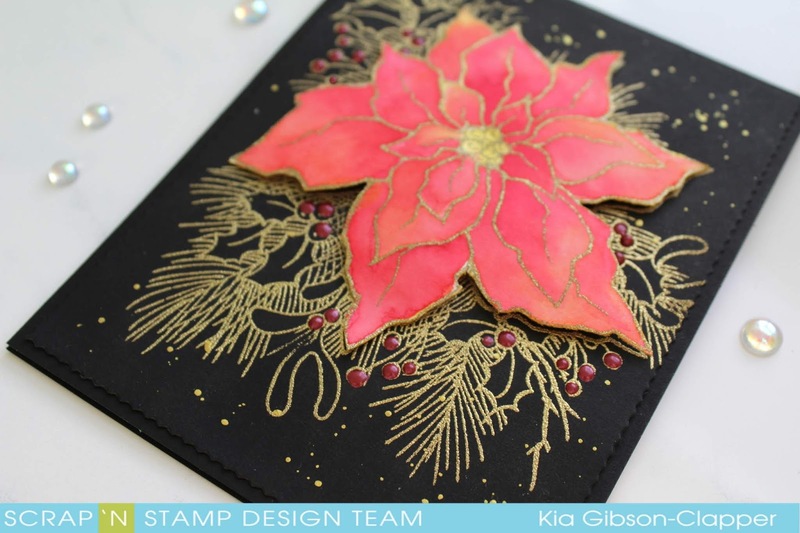 I then inked up the stamp with versamark and heat embossed with gold embossing powder. I then stamped the image again on Fabriano Hot Press watercolour paper which I also heat embossed with the gold embossing powder. 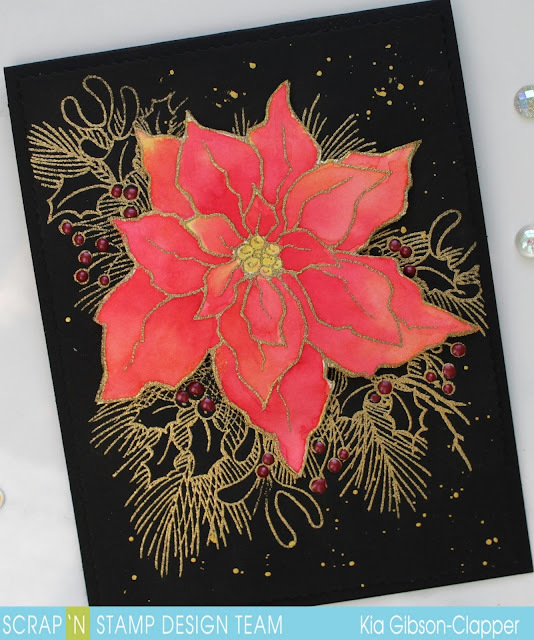 I wanted my poinsettia to jump off the page, so I watercoloured using Ken Oliver Color Burst powders in Lemon Yellow, Fuchsia and Alizarin Crimson, doing several layers until I was happy with the look, then set aside to dry. With gold paint I added splatters to my black card panel. 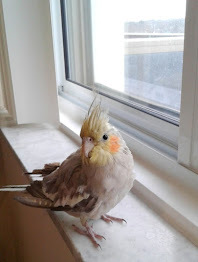 Once my poinsettia was dry I ran around the cut edges with my gold feather pen. There is nothing worse than white edges on a black card, in my humble opinion! 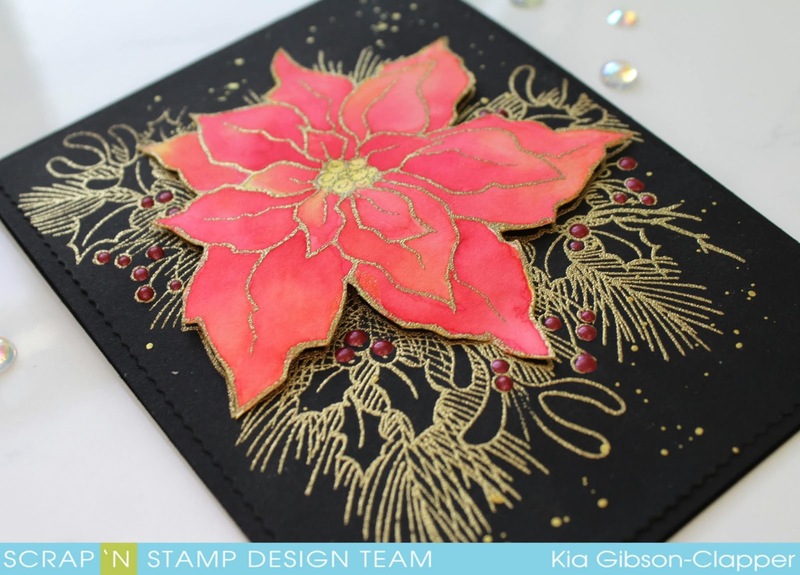 To finish I styled the poinsettia a bit and attached it to the card base using foam squares. I then added Nuvo Jewel Drops around the card on the stamped berries. My first time inking up this beauty from Studio Katia which I did to play in the Inspiration Challenge at Splitcoaststampers today. I did some watercolour using Daniel Smith and Schmincke watercolours. This is a picture of my inspiration piece. Keeping these colours in mind I first heat embossed my image using white embossing powder, then proceeded to watercolour using the purples, turquoise, blues and pinks. I added gold to the saucer, and idea I saw on Studio Katia's blog. Once I was finished with my image, I splattered paints to the background. 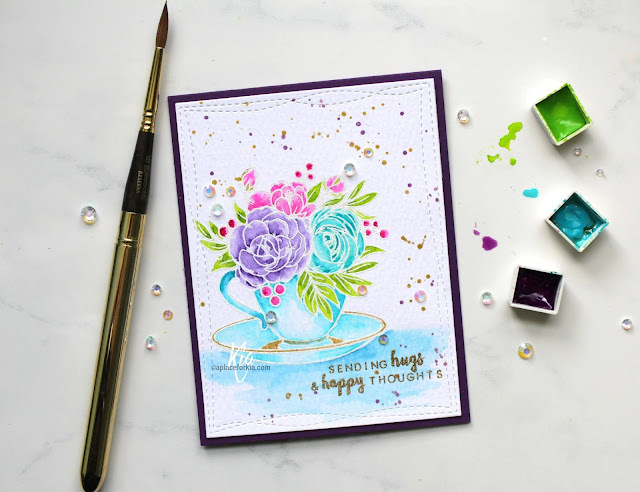 A little tip for doing this if you don't want it on your image, turn over your stamp to cover your image and do the splatters, then wipe of the back of the stamp. I die cut my piece with my wonky stitched die from My Favorite Things, and it is my favorite and attached my panel to a dark purple cardstock. 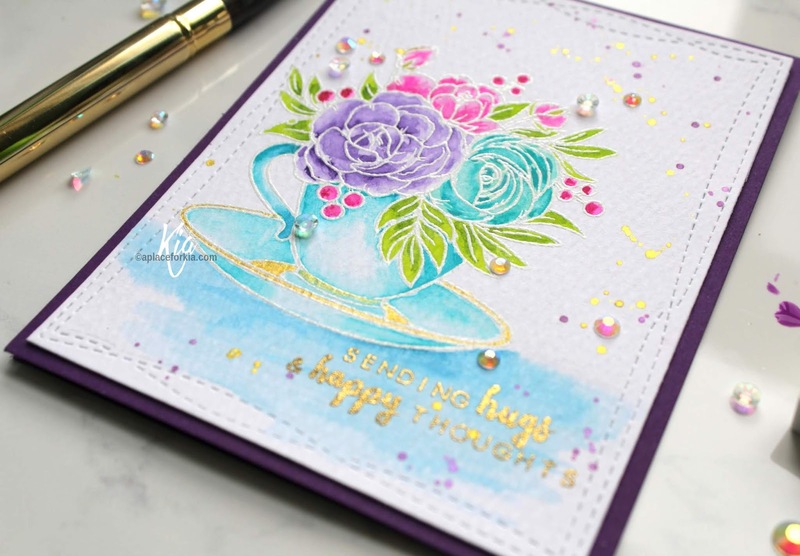 I then stamped my sentiment and heat embossed with gold embossing powder, and finished off with a few of the beautiful Studio Katia crystals. 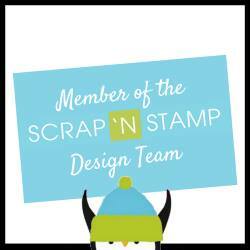 Welcome to the Scrap'n Stamp October Blog Hop. 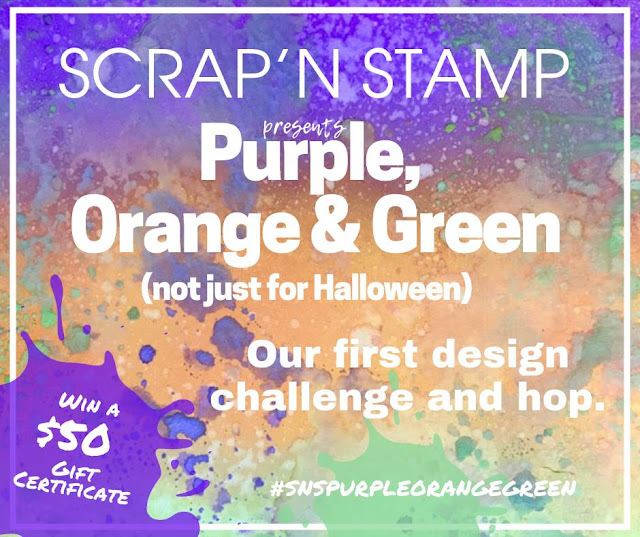 This month the design team is featuring colours from the season being purple, orange and green. This month we are trying something new. 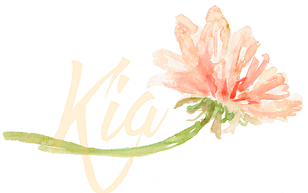 We would like to invite you to play along with our blog hop this month. Check out on our new Facebook Challenge Page to play along. We also have three (3) $25.00 gift certificates to give away, so be sure to leave comments as you go through the hop to have your name entered for the drawing by October 25th. The draw will be held on October 26th and announced on the Scrap'n Stamp Blog. 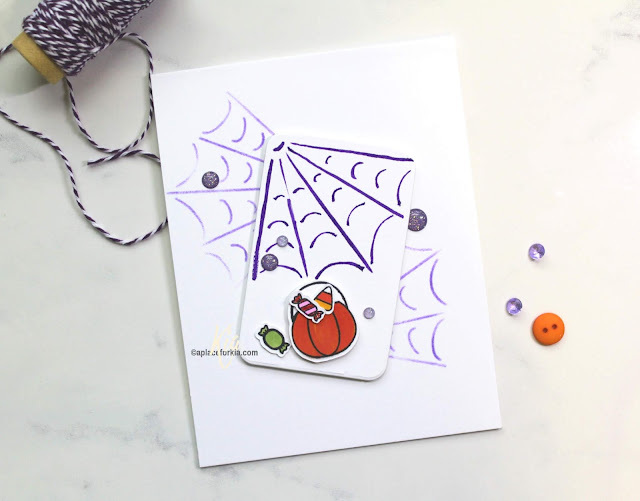 These colours are fabulous together and screech Halloween for me, so I went with Halloween for one of my cards, where I used a new stamp set from Lawn Fawn called Pick of the Patch, which is just too cute. 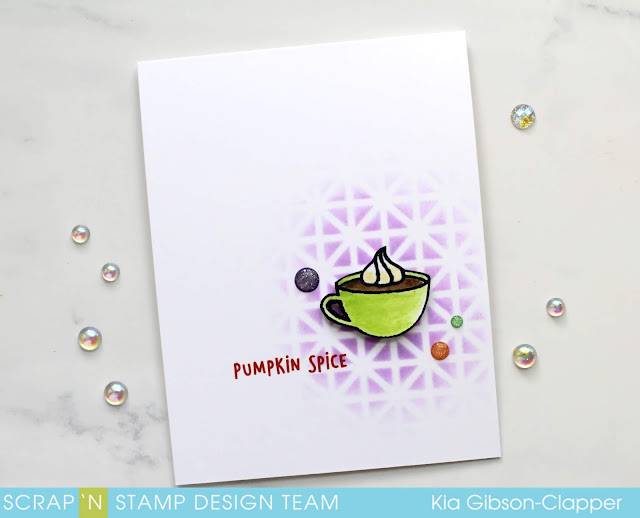 For my second card I used another Lawn Fawn set called Pumpkin Spice. 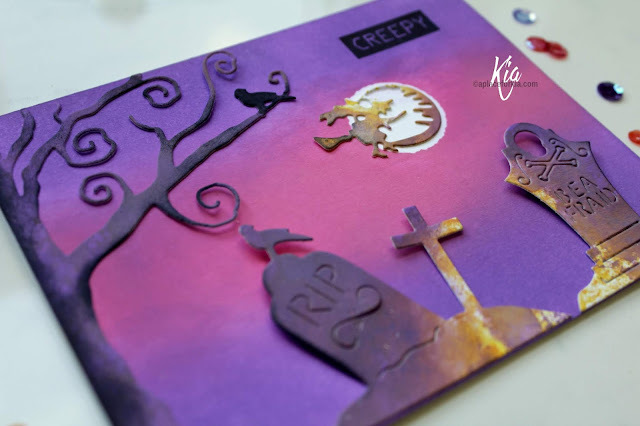 Starting with the It's Halloween card, I first masked off the area for the moon, then did a distress oxide background with wilted violet and twisted citron. I removed the mask and covered the sky area to do the moon, using squeezed lemonade and fossilized amber. 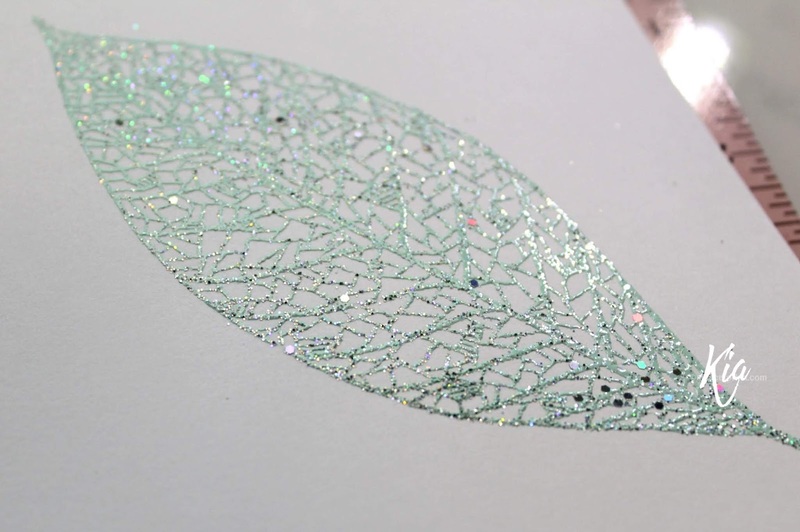 Covering the grass area, I splattered the top of the card with water droplets. 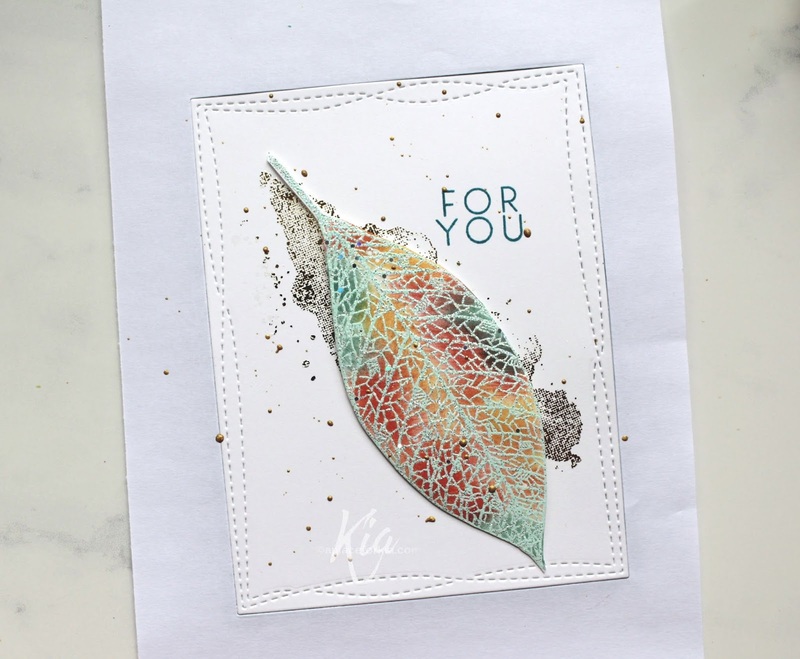 I then stamped the trees using Ranger's Jet Black ink then added Wink of Stella to some of the droplets and the tree branches and set aside to dry. I stamped the pumpkins and squirrels on watercolour paper using Ranger Archival Inks in Monarch Orange for the pumpkins and Sepia for the Squirrels, cut them out, and watercoloured with distress inks in fossilized amber, carved pumpkin and ripe persimmon on the pumpkins. For the squirrels I used gathered twigs, hickory smoke and frayed burlap mixed with barn door. On a piece of card stock I sponged on the fossilized amber and wilted violet, forming the moon in the sponging, then stamped and heat embossed my sentiment using white embossing powder. I die cut the sentiment and attached using foam dots. 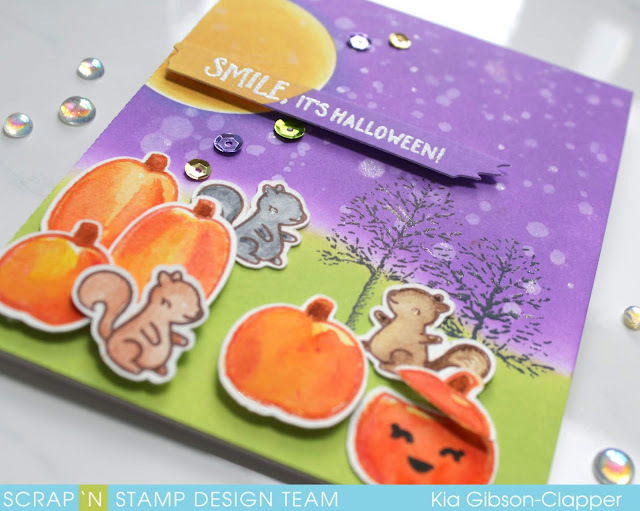 I then arranged the pumpkins and squirrels and attached, using foam squares for a few. I finished up by stamping a face on one of the pumpkins along with adding a few sequins in various colours. My second card is a fast and simple card to make. 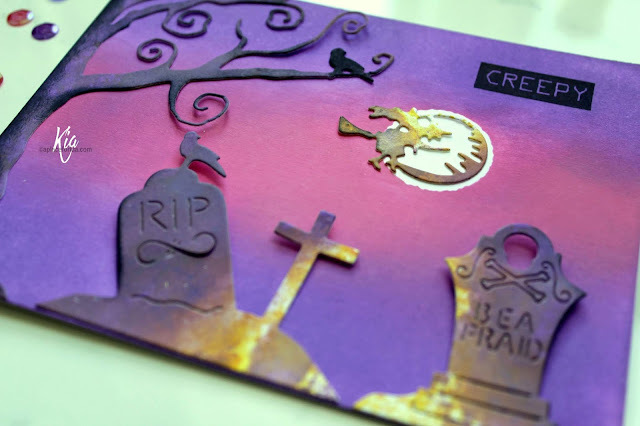 I first stenciled an area of my card base using distress oxide in wilted violet. I stamped the cup on watercolour paper and painted the cup with twisted citron, I used walnut stain to paint the cocoa and antique linen on the whip cream. I cut out the cup and attached it using foam squares. 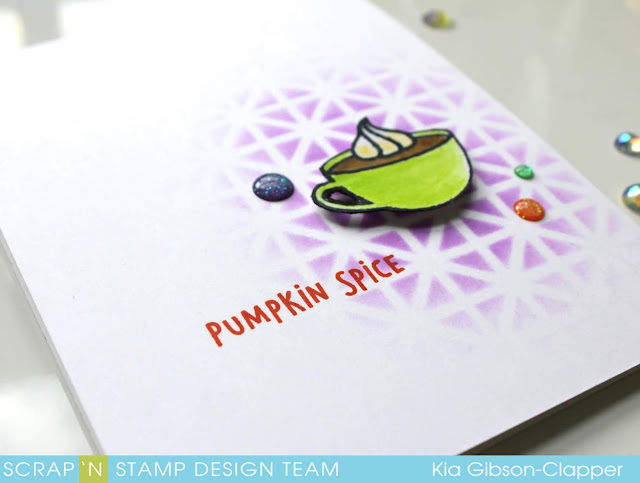 I then stamped the sentiment with Ranger's monarch orange, and finished my card with a few gumdrops in the challenge colours. 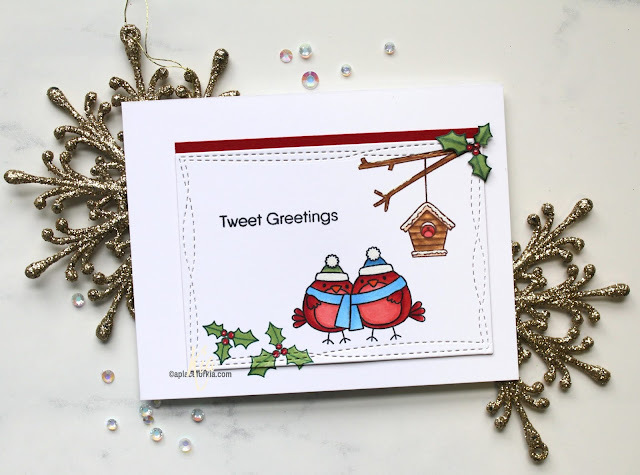 I hope you have enjoyed these cards today as much as I enjoyed making them. If you have lost your way, following is a list of the team and their links. I have done this card for My Sweet Petunia (MISTI), Team Tuesday blog post and thought I would share it here too. 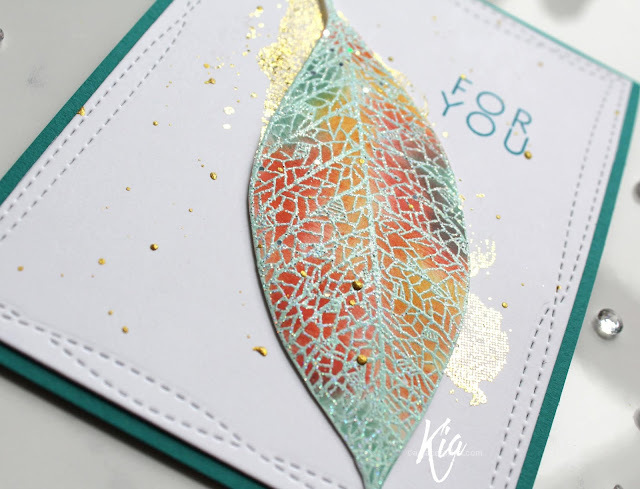 I have used deco foil with the background leaf shadow, and it does not like to be photographed. The above picture is the closest picture that I managed to get to show what it really looks like, so if you like foil, you will like this project. 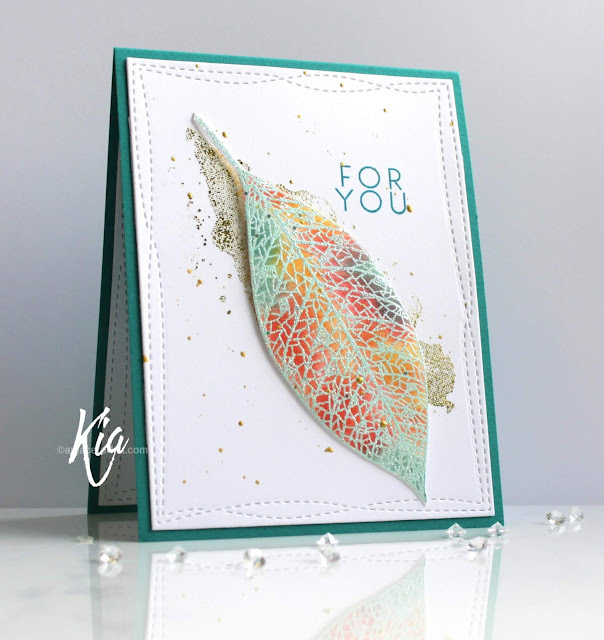 In my mini Misti I stamped the background stamp using versamark embossing ink and heat embossed using white embossing powder. 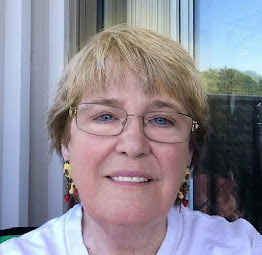 While it was still warm, I put the foil over the top and ran it through my laminator, as suggested by Jennifer McGuire. I think the next time I may try embossing with gold embossing powder to see if this makes a difference in photographing. I then die cut the panel with my wonky stitched die and attached it to my teal card base. 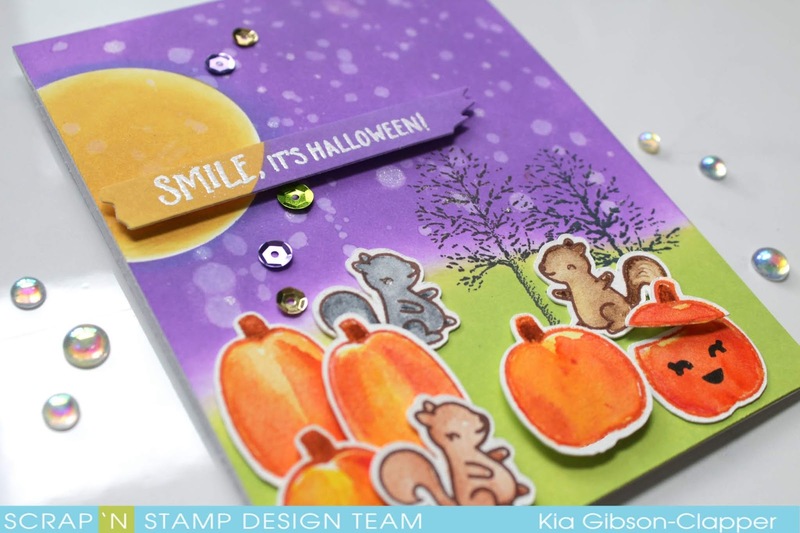 I put the coordinating stamp in my Misti, stamping and heat embossing with a Vintage Mint embossing powder. So pretty. 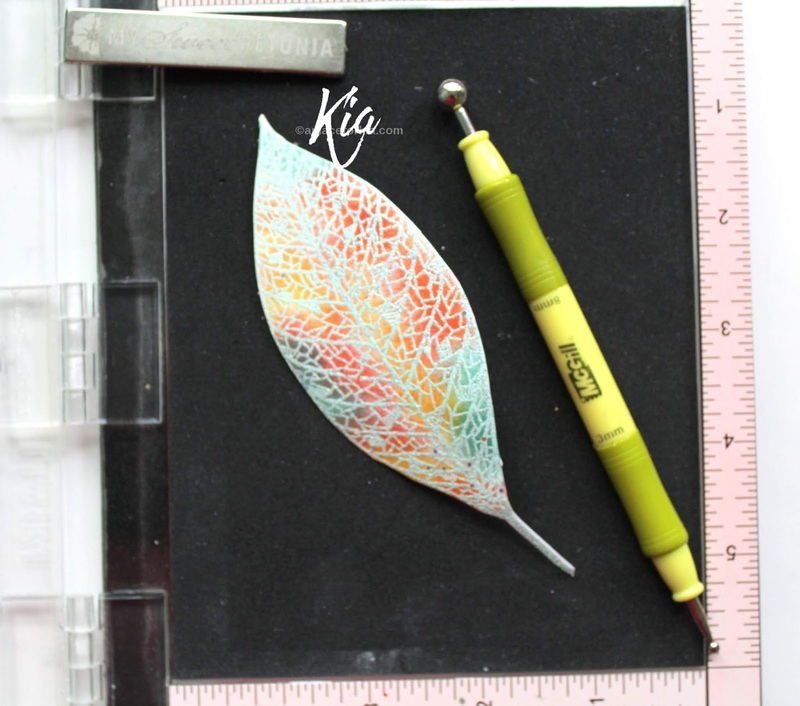 I then sponged the leaf with cracked pistachio, evergreen bough, spiced marmalade and abandoned coral distress inks, then fussy cut the leaf. 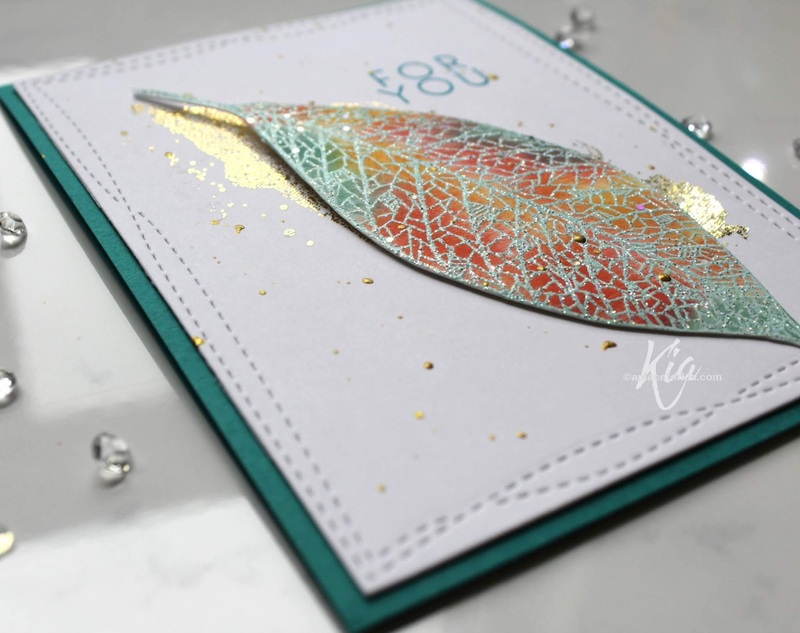 Back in my Misti, I flipped over the mouse pad and styled my leaf to give it some movement on my card. I put the card back in my Misti and stamped the sentiment using Ranger Archival ink in Paradise Teal. 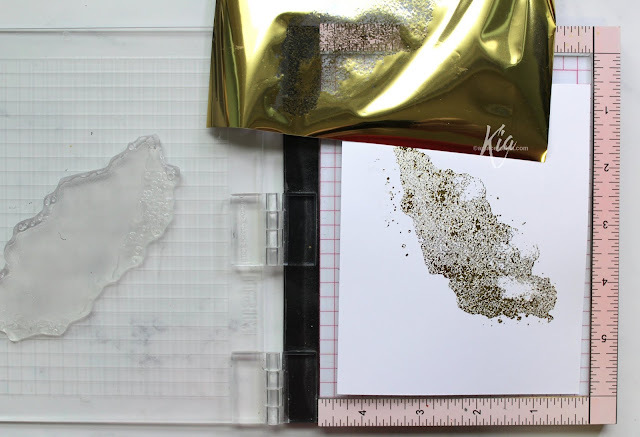 I also wanted some splatters of gold paint, so I made a cover from photo copy paper, and splattered away. This way I don't have to worry about getting ink on my card base. If I had done the panel before attaching it, I would have to wait for it to dry completely ... who has that kind of time, right? I hope you have enjoyed this tutorial today, and would like to thank you for visiting.